Police officers caught 15 people inside the Castillo de San Marco. There were 13 adults and 2 minors. They had been inside for almost an hour. The Castillo de San Marcos did have “signs posted at the entrance clearly [stating] the park is closed due to the government shutdown.” The St. Augustine tourists “admitted they saw the sets of signs.” The “families were only given a verbal warning and an invitation to come back to see the fort the legal way once the government shutdown ends.” No one was arrested in connection with the trespass. They did not damage the property. The Florida Trespass Laws can be found in Chapter 810 of the Florida Statutes. This Chapter also includes Florida Burglary Laws. Trespass may be to a structure or conveyance or to other property. 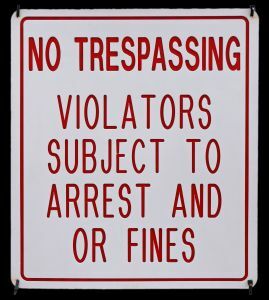 If you have been arrested or given a citation for trespassing in Jacksonville or the surrounding towns, contact a Jacksonville criminal lawyer at 20 Miles Law. Call (904) 564-2525 to speak with a Jacksonville criminal attorney about your case.